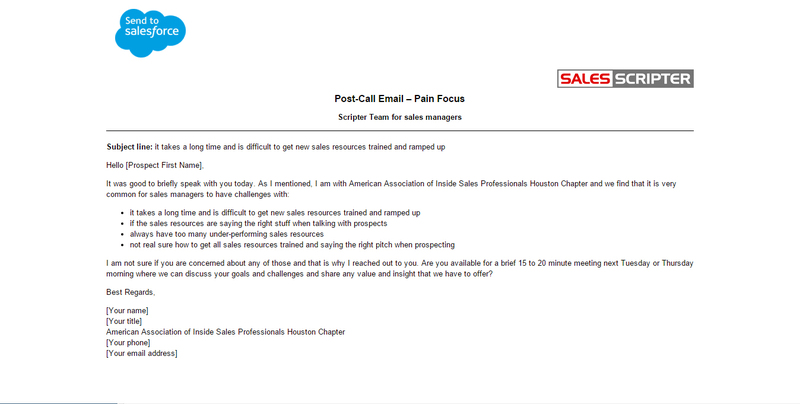 It can be the difference between success and failure when cold calling when developing a calling script. With that said, the good news is there are clear things you can do to develop a cold call script which positions you to reach the most of your potential. First, with developing a cold calling script, you need to identify who the script is for and who your target market is by identifying what is your ideal prospect in terms of characteristics like geography, industry, title, department, size of company, etc. This step is important and often overlooked and by spending time here, not only will you develop a more fine tuned script, but you’re also more likely to develop a better target list of prospects. 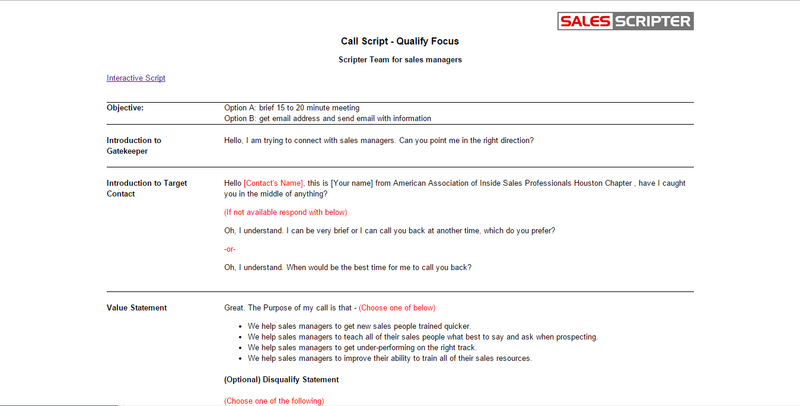 Many salespeople leave out sharing the business value that the salesperson has to offer in their script and cold calling introduction. 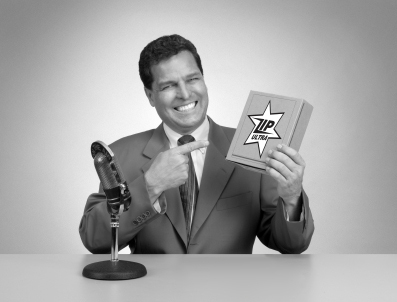 It is very easy to fall into a trap of talking about our company, our products, and our services. Stop to identify what the core value is that transfers from you to your clients as well as compose a value statement when developing a cold calling script. Put your value statement at the beginning of your cold calling script to tell your prospects right away the value that you have to offer them. Then, explain to them why they should spend the next 2 to 5 minutes speaking with you and take your call. 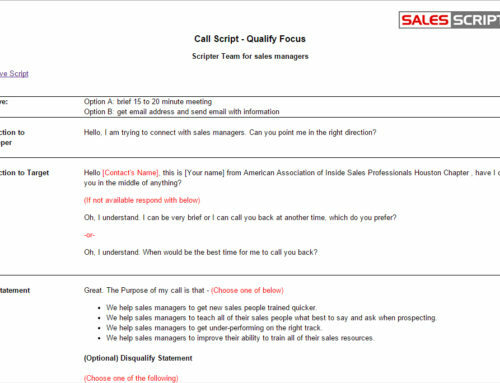 A disqualify statement is an optional ingredient that can be added to a calling script. 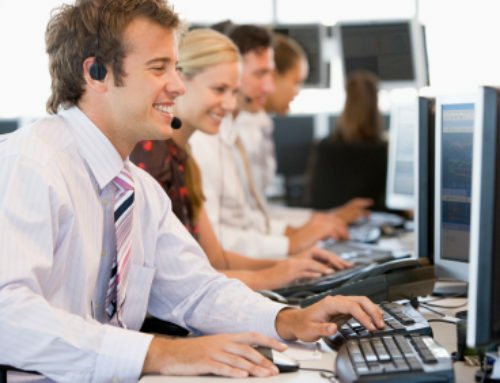 This would be a statement that says something like, “I don’t know if you are the right person to talk to or not” or “I don’t know if you all are a good fit for what we have.” This statement is very powerful early in a cold call due to it decreases the prospect’s guard and sometimes creates curiosity. Remember that your time is extremely valuable which means you only want to spend your time with prospects that show a decent probability of purchasing. To help you with this, your cold calling script needs to include qualifying questions. Asking a few questions to qualify a prospect will allow you to gather some valuable information as well as make the call more conversational. As a result, the prospect will be more engaged and decrease their guard. 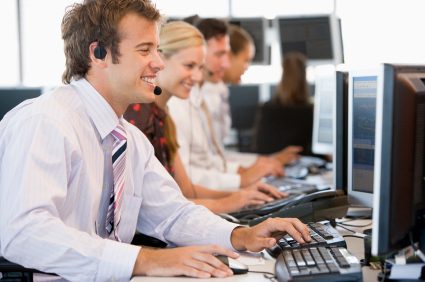 Uncovering pains should be one of your goals during cold calling. 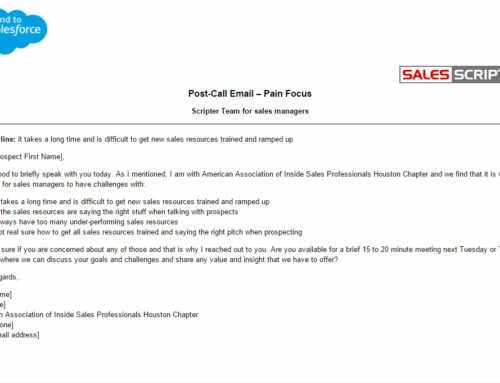 Create a list of typical pains that your ideal prospects have and put these points into your cold calling script. This enables you to share some of them to the prospect during the cold call to help identify if they have any related pains. There will be a point in the call when you’re going to need to build some level of interest on the prospect’s side. You can do this by building a list of points that you can mention to try to strike a chord. The following are some areas where strong points can be developed. 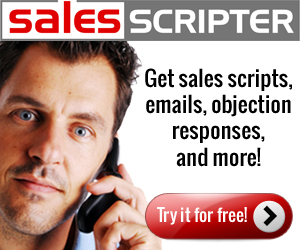 SalesScripter provides tools to help sales pros with producing a cold calling script.